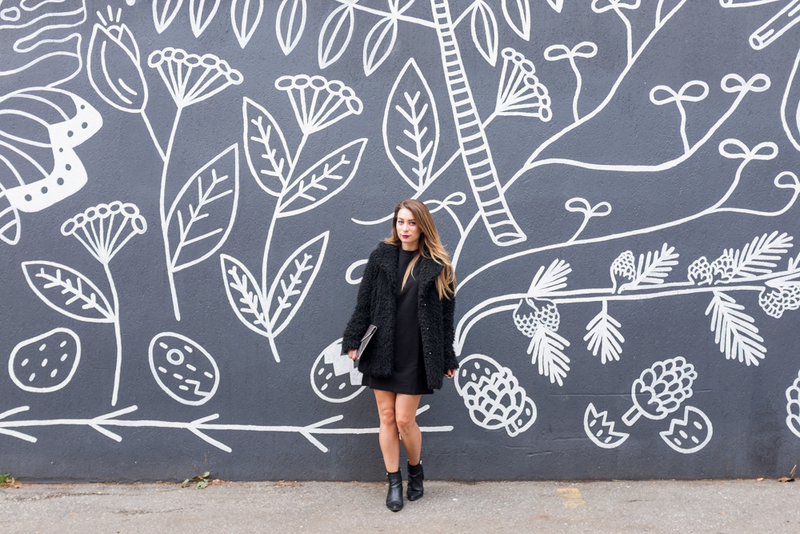 OOTD - All Black Holiday Look | La Petite Noob | A Toronto-Based Fashion and Lifestyle Blog. Okay, can we talk about this glittery Rebecca Minkoff Leo clutch? When I first purchased it, I was doubtful that I would get much use out of it and kind of wrote it off as an impulse buy. Since receiving it, I've worn it out more times than I can count, which is a happy surprise! I think that it's the perfect accessory to add a bit fun to any outfit, and is definitely a conversation piece. One word of caution though - because it is quite literally made out of pure glitter, it has a rough texture and tends to catch on clothing. You don't need to douse yourself in sequins and colour for the holidays. Sometimes just a bit of texture and a fun accessory is all that you need to create something special - while still staying in your comfort zone. What do you think? Right up your alley, or two subdued for a holiday party? Let me know! I cannot tell you how much I love this look on you. I know I was saying you're a total glitter girl, but you do all black so well too - it's almost not fair to the rest of us who look good in only one style! LOL you're too nice Siffat! That's so great to hear, especially since I feel conflicted with my personal style. I have two extremes - all black, or explosion of glitter and faux fur lol. I need to get types on the ulna-cool minimalist style from you, I can't seem to nail it xo. I am so in love with this outfit! That jacket is so cute. I've seen similar in white and I just love it! I'm a big fan of the simple, all black holiday look as well. It's my favourite go to for holiday parties when I'm not quite sure what to wear!